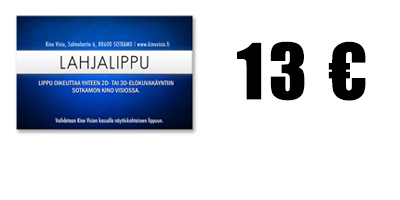 Kino Visio is located in immeadiacy of Sotkamo towncenter at Salmelantie 6. When arriving from Vuokatti drive through the city center towards the church, before which Salmelantie will be at your left hand side. After about a 1 kilometer the theater will be on the left side of the road where you can also park your car. Please use the main entrance and follow the stairs to ground floor where Kino Visio’s box office and the theater hall is located. The building also has a elevator which is located at the right side of the entrance down the hallway. Our box office desk answers between 12 PM – 7 PM. Tickets will not be sold trough phone, but reservations can be made. Reserved tickets must be claimed 30 minutes before the screening. Box office desk opens 30 minutes before the days first screening. Tickets need to be purchased on location. As of now we are not currently selling tickets online nor through phone, but reservation can be made. Reserved tickets must be claimed 30 minutes before the screening.